Is there a keyboard shortcut for word count? The short answer is, yes, there is a keyboard shortcut, and I will give it to you at the end of this blog post. But before we do that, let’s take a closer look at a few common usage scenarios where knowing the shortcut will help you save time and efforts in fine tuning the document. We often write articles which have a word limit. Often abstracts have a very strict word limit. While writing things you should be able to monitor the number of words already written. This is very easy. Word status bar shows the word count as you type. In case you cannot see the word count, right click on the Status Bar and choose Word count. It is a long list. Take few more seconds to see what else is useful and choose those options as well. Section number is also another very useful indicator. Now the word count will be shown live. Often we write the abstract followed by the actual article. 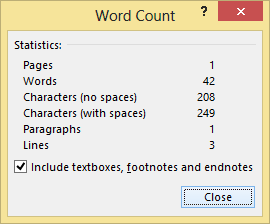 So if you want to know the word count of only the abstract what do you do? Just select the abstract (or any other area) and choose Review Tab – Word Count. Now it is shown in detail. If you notice, there is an option to include or exclude things other than the main document. Of course there is a keyboard shortcut available. Just press Ctrl Alt G. That’s it. If you are fine tuning a document with a strict word limit, this will come in very handy. This is a rare case where the tooltip of the button does not show the keyboard shortcut. I have notified Microsoft about it. I am quite confident it will be corrected in the next version.